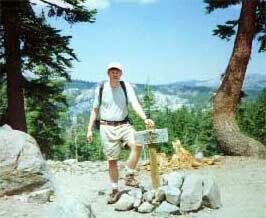 7-23-98 / Castle Pass (7880') - Micah and I passed this saddle in route to Andesite Peak (8219') in the Tahoe National Forest. The trailhead is on the I-80 just minutes west from where we stay at Donner Lake. We covered the three miles to this point in one hour and five minutes. 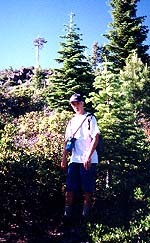 7-8-99 / Prosser Hill (7171') - Micah (on left) climbing Prosser Hill near Truckee, California. We had decided to go cross country and ended up getting trashed by dense brush. Dan (on right) pointing to where we just came up. The summit on the far right is Donner Peak (8019'), which is one of my favorite destinations. 4-1-00 / Eaton Canyon Falls via the Eaton Canyon Nature Center - Christa and Dan made this leasurely hike with her Girl Scout troop, three miles. The hike from Eaton Canyon Park to the waterfall is 3.4 miles round trip. Eaton Canyon Park has a beautiful nature center and trails which serve as a primary venue for honing my plant indentification skills. The 7,600 square-foot building contains many fascinating displays, live animals, offices, classrooms, an auditorium, restrooms, and an information desk/gift shop. The Center is open from 9 a.m. to 5 p.m daily. Visit the Eaton Canyon Nature Center website. 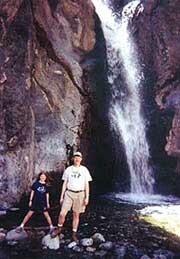 View my Waterfalls of the San Gabriels web page. 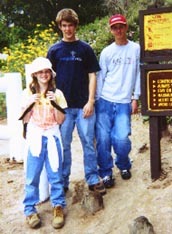 5-28-01 / Dawn Mine - Christa, Micah, Ricky M., and Dan hiked the 2.5 miles up Mallard Canyon to Dawn Mine. View my Dawn Mine page. This page was last updated February 9, 2006.